So, you have decided to discuss with your school, or your child’s school, the possibility of having shorts and pants for girls added to the uniform policy. Great to hear! Before you start, check out our Why Options for Girls, and Arguments and Rebuttals pages, so that you engage in these discussions well informed about why this choice for girls matters. 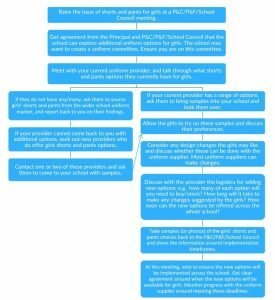 Below we have created a flow chart outlining the steps to follow on this journey for change in girls’ school uniforms. This flowchart can also be downloaded here: Steps to Take – Pants_Shorts for Girls, so that you can share it with your school leadership team.